The running must end when the past finally catches up with Clara, allowing Eleanor to finally find out the truth behind her existence and the past which gave her eternal life. At the same time that she is coming to terms with her past, Eleanor meets a young boy with an illness and is able to imagine a future for herself without the turmoil brought on by Clara. 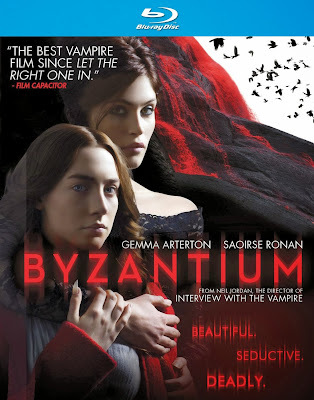 Byzantium is not Jordan’s best film, perhaps not even his most impressive vampire movie, but it is far better than a majority of imitators out there these days. There are enough visually satisfying moments within the film to overcome any narrative weakness. The Blu-ray includes only a few interviews and the theatrical trailer as a disappointing lack of extras.